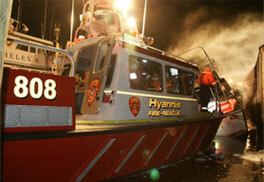 The Hyannis Fire District was established in 1896. 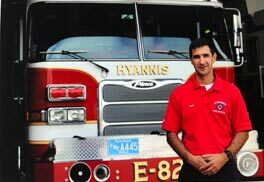 It is the oldest of the five fire districts in the Town of Barnstable and is governed by a five member Board of Commissioners elected by the voters of the District. If you see a red fire hydrant with a white cap then you are within the Hyannis Fire District. The Department serves approximately 9 square miles of land as well as Lewis Bay and Hyannis Harbor. The year round population of the district is 18,000. During the summer months the population increases significantly with many as 100,000 visitors to our community. Hyannis is the hub of Cape Cod and provides many unique services for its residents and visitors. The fire district includes: the harbor and ferries, that bring in over a million people per year; the largest hospital on the Cape; the state’s third busiest airport; the transportation center; four high schools; a large shopping mall; numerous social service agencies and a bustling downtown. In 2015, there were 7,002 calls for service: 1,359 fire calls and 5,643 emergency medical calls. 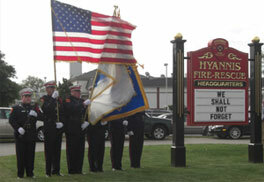 The fifty-four uniformed men and women who serve are all cross-trained in fire, rescue and emergency medical services. The fire fighters are organized in four shifts of twelve. There are six members of the Department who perform administrative duties. The Department operates 3 Advanced Life Support ambulances, 3 pumpers, a heavy rescue vehicle, an aerial ladder tower, a 34-foot boat and adjunct apparatus. Members of the Department serve the community with duty, honor and distinction. Our goal is to provide superior and integrated emergency response to any situation that threatens the life, safety and well-being of persons and property within the district. In addition to fire suppression and emergency medical services, the department conducts fire prevention, code enforcement, fire investigations, mitigation of hazardous material incidents, special rescue responses, maritime emergencies and public safety education. Please explore this web site and learn more about the service that the Department provides our community.